VANCOUVER, Nov. 5, 2018 /CNW/ - Mawson Resources Limited ("Mawson") or (the "Company") (TSX:MAW) (Frankfurt:MXR) (PINKSHEETS: MWSNF) is pleased to announce the Company has signed Exploration and Option Agreements for one of the largest areas prospective for epithermal gold in the lower mainland USA (150,500 hectares) from an arm's length private landholder (the "Landholder"). While Mawson shall maintain a sharp focus on its flagship Rompas-Rajapalot gold-cobalt project in Finland where preparation for a substantial winter drilling program is well advanced, this new Western USA project ("the WUSA project") presents the opportunity for rapid progress and discovery in an alternate jurisdiction. Dependent on results, the WUSA project is being explored with a view to potential future joint venture, strategic alliance, or corporate transaction. A 2.2 km long and up to 400-metre-wide zone where soil geochemical samples regularly exceed 1g/t Au (up to 5.51g/t Au) (Figure 2). These gold anomalous soils lie above highly acid altered rocks. The prospect has never been drilled. A series of siliceous ridges which trend over 3 kilometres, with high sulphidation vuggy silica textures and acidic steam vents that outcrop for 1,000 metres. Geochemically anomalous rock samples with Sb, As, Hg, Bi, Mo are coincident with classic epithermal alteration zones (alunitic, silicification, argillic and propylitic) (Figures 3-6). The prospect has never been drilled. A high-level maar-type low sulphidation epithermal system developed over an area of more than 3 square kilometres. The only prospect area previously drill tested, where 10 vertical RC holes have intersected anomalous gold over significant intervals. Work to date by Mawson on the WUSA project has consisted of mapping, soil sampling, regional stream sediment sampling and ground magnetic geophysical surveying. A reconnaissance 2,000 metre diamond drill program has just commenced at the Huckleberry and Scorpion prospects. Mr. Michael Hudson, CEO, states: "Mawson is always on the look-out for high quality projects in attractive jurisdictions that complement our exploration in Finland. 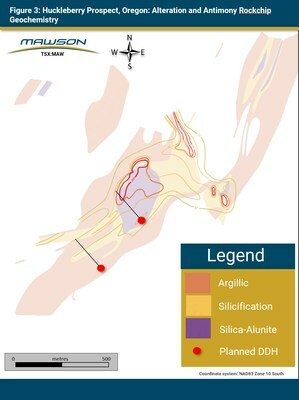 The WUSA project is certainly one of these projects, presenting a unique opportunity to explore one of the largest contiguous gold-prospective areas in mainland USA. The project has escaped significant modern exploration as it has sat behind locked gates for the last 150 years, and now delivers Mawson a new epithermal exploration frontier in a first world country. 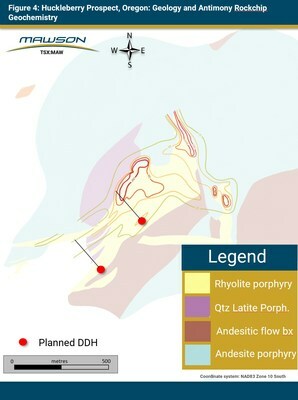 Should significant gold be found in the upcoming drill program, we will review the opportunities for a joint venture, strategic alliance, or corporate transaction to create optionality and further value for shareholders." The WUSA Project lies in the central Western Cascade Ranges of Lane and Douglas Counties, Oregon, USA and consists of an area of interest of 150,500 hectares ("Exploration Agreement Area"), of which 68,075 hectares of mineral and land rights ("fee-simple land") are held by the Landholder. Also, within the Exploration Agreement Area are smaller areas of mineral rights owned by the Landholder (1,447 hectares), the Bureau of Land Management ("BLM") claims held by the Landholder (333.1 hectares) and directly by Mawson (142.2 hectares) (Figure 1). The Cascade Range in Oregon is underlain by Eocene to Holocene intermediate to felsic volcanics and volcaniclastics rocks erupted along the western margin of North America. Immediately adjacent to Mawson's 150,500 hectare WUSA project lies a well-mineralized district containing multiple mineral deposits including polymetallic veins (Bohemia, a gold-rush mining area discovered in 1858) and a historic hot-spring style mercury mines. Placer mining is still undertaken within the option area. 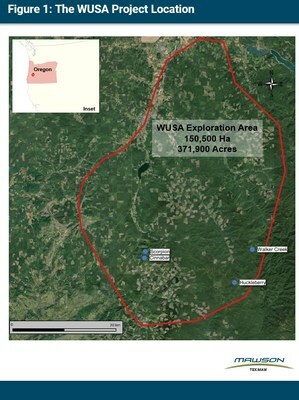 The WUSA Project consists of an underexplored, telescoped high level caldera complex with significant gold potential. Prior to Mawson's involvement, only sporadic regional stream sediment and soil samples were collected, and one small area at Walker Creek drill tested. Epithermal precious-metal vein deposits identified to date within the option area include the Scorpion, Huckleberry and Walker Creek prospects with new anomalous stream sediment catchment areas identified but yet to be followed up. 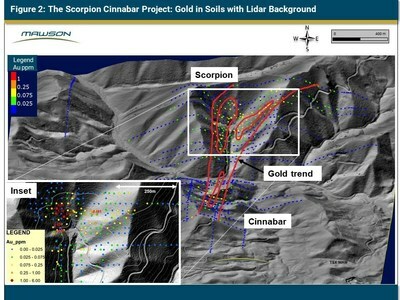 Scorpion is a 2.2 km long by up to 400-metre-wide area where soil geochemical samples regularly exceeding 1g/t Au. These gold enriched soils overlie highly acid altered rocks with up to 5.51g/t Au, however a bedrock gold-mineralized source has not yet been identified (Figure 2). The prospect has never been drill tested and Mawson plans to drill three 400 metre long drill holes to test below the gold anomalous zones. Mineral tenure at Scorpion consists of fee-simple land held by the Landholder. Drill permits have been received from the Oregon Department of Geology and Mineral Industries ("DOGAMI"). 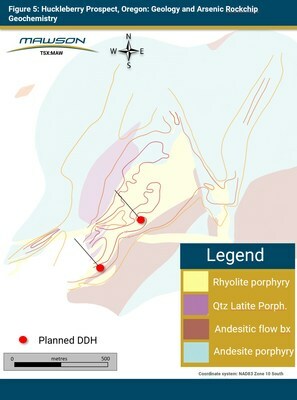 Huckleberry is a high sulphidation gold prospect with an area of intense hypogene acid sulphate (quartz, alunite, clay) alteration known in outcrop for 1,000 metres along strike (Figures 3-6). A northeast trending shear zone over 1,600 metres long and up to 300 metres wide forms the core of the prospect area, and is associated with strong As, Sb, Hg, Bi, Mo anomalism and argillic and silica-alunite alteration. The prospect has never been drilled and Mawson proposes to drill two 400 metre long drill holes to test for buried targets at deeper structural levels. Tenure at Huckleberry is comprised of areas of landholder mineral rights plus areas of claims placed by Mawson and the Landholder on public land administered by the BLM. Drill permits have been received from both the BLM and DOGAMI. The Walker Creek prospect consists of a maar-type hydrothermal vent with adularia associated low sulphidation gold mineralization and corresponding Ag, Hg and Sb. Work conducted in early 1990's by the Landholder consisted of detailed mapping, surface sampling and drilling. Ten vertical reverse circulation ("RC") holes drilled in the early 1990's by the Landholder intersected thick intervals of anomalous gold with better intersections including 12.2 metres @ 1.3g/t gold and 6.1 metres @ 1.2g/t gold. Although Mawson has no immediate plans to drill at Walker Creek, the prospect requires further drilling to target structural controls. Tenure at Walker Creek consists of both fee-simple land and BLM land claims. Three agreements have been signed with the Landholder to provide access and secure 100% of the mineral rights for the WUSA project subject to certain royalty clauses. Mawson has the right to explore the project initially for three years and must incur costs of US$500,000 of in-the-ground expenditures and lease payments of US$100,000 in Year 1 before electing to continue onto further years of exploration. The qualified person for Mawson's Finnish projects, Dr. Nick Cook, President for Mawson and Fellow of the Australasian Institute of Mining Metallurgy has reviewed and verified the contents of this release. Mawson Resources Limited is an exploration and development company. Mawson has distinguished itself as a leading Nordic Arctic exploration company with a focus on the flagship Rompas-Rajapalot gold cobalt project in Finland. Idea Drilling are conducting the diamond drilling producing oriented NQ diameter (46.7 mm) diamond drill core. This news release contains forward-looking statements or forward-looking information within the meaning of applicable securities laws (collectively, "forward-looking statements"). All statements herein, other than statements of historical fact, are forward-looking statements. Although Mawson believes that such statements are reasonable, it can give no assurance that such expectations will prove to be correct. Forward-looking statements are typically identified by words such as: believe, expect, anticipate, intend, estimate, postulate, and similar expressions, or are those, which, by their nature, refer to future events. Mawson cautions investors that any forward-looking statements are not guarantees of future results or performance, and that actual results may differ materially from those in forward-looking statements as a result of various factors, including, but not limited to, capital and other costs varying significantly from estimates, changes in world metal markets, changes in equity markets, planned drill programs and results varying from expectations, delays in obtaining results, equipment failure, unexpected geological conditions, local community relations, dealings with non-governmental organizations, delays in operations due to permit grants, environmental and safety risks, and other risks and uncertainties disclosed under the heading "Risk Factors" in Mawson's most recent Annual Information Form filed on www.sedar.com. Any forward-looking statement speaks only as of the date on which it is made and, except as may be required by applicable securities laws, Mawson disclaims any intent or obligation to update any forward-looking statement, whether as a result of new information, future events or results or otherwise.